Last Saturday, we kicked off the holiday season with a fantastic wine-food pairing holiday dinner at the Barona Steakhouse. 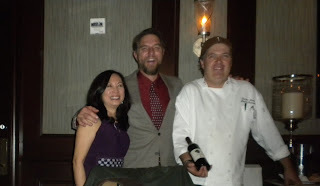 Chef Duncan’s delicious tasting menu was meticulously prepared and each dish was expertly paired with our 2009 Mahogany Mountain wines. Once again, I was able to live out my fantasy of serving our wines and sharing a gourmet feast with our wine club, friends and family with everyone sitting around a very long table in a stately and exquisitely decorated private dining room, served by a team of professional wait staff, just like in the movies. I felt blessed as I looked around the table seeing happy faces enjoying themselves as they tasted our wines and delicious food. I loved the Seared Sea Scallop in Champagne sauce that was paired with our Pinot Gris. The crispness and floral aroma of our Pinot Gris brought out the sweetness of the scallop which was beautifully floated on top of the Champagne sauce. The entire table hummed with happy sounds when everyone tasted the Smoked Short Rib Risotto with our 2009 Merlot. What a perfect pairing! Words simply cannot describe the sensational senses in my mouth when I took a sip of Merlot after taking a bite of the Short Rib Risotto. I think Chef Duncan and staff outdid themselves again. Our 2009 Cabernet Sauvignon was fantastically paired with the main course that I chose: Wood Grilled Filet Mignon and the Truffled Mashed Potato with a splash of Red Wine Sauce. The medium-rare tender steak was cooked to perfection. I thought my dress would burst around the waist line when the dessert came out. The chocolate lava cake and caramel homemade ice cream were put together in a beautiful dish decorated with fresh raspberries, strawberry slices and blueberries. Of course, I had no will power to say no, especially, when the wait staff started passing out two of our dessert wines in beautiful port glasses. Since everything looked so good, I decided to go for it. What the heck! I thought I was in heaven after the first taste of the lava cake and ice cream, and a sip of our 2003 dessert wine. Last but not least, Anna, Geoff’s girlfriend, sent everyone home with a beautiful bouquet of homemade cake pops, that she and Geoff spent hours making. The cake pops were presented in our logo glass filled with gourmet chocolates. After that heavenly dinner, I felt that life was still good and the fiscal cliff seemed to be less scary. Happy Holidays! Joy, Peace and Love to All!